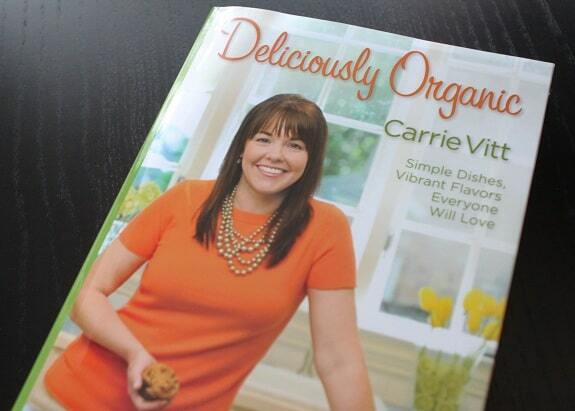 I am thrilled to share with you a new cookbook today by my friend Carrie Vitt titled Deliciously Organic. 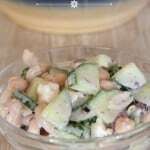 Carrie’s recipes are beautiful, healthy and simple to prepare. Do yourself a favor and pick yourself up a copy today! Here’s the cover of Carrie’s book, cute right?! Helene Dujardin of Tartlette photographed Carrie’s book and the photos are absolutely stunning. Wait until you see them. Really lovely. I love how there are only a few ingredients here and they really are a breeze to whip up. Whisk all ingredients together in a medium saucepan over medium heat. Continue to whisk to dissolve cacao into milk (this will take a minute or two). Warm until steaming, stirring frequently. 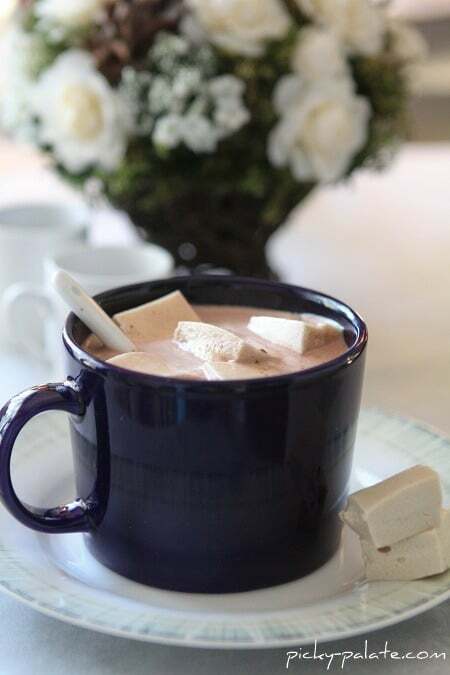 Pour into mugs and serve with maple marshmallows. Sprinkle gelatin over 1/2 Cup water in a bowl of a standing mixer with whisk attatched. Set aside for 5 minutes so the gelatin can soften and bloom. Lightly oil a 13×9 inch baking dish. 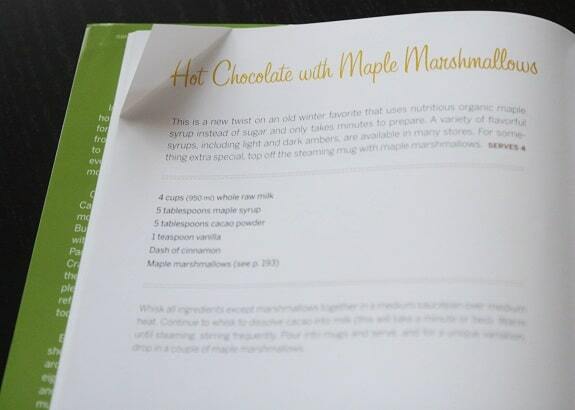 Whisk together the maple syrup and salt in a medium saucepan over medium heat. Gently simmer until syrup reaches 240 degrees F. With mixer on medium speed, very slowly add maple syrup to gelatin and water in mixing bowl. Add vanilla and turn mixer on high for 10 minutes until liquid had doubled and becomes light and fluffy. Pour into dish and let sit overnight. 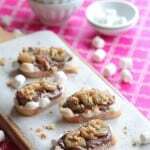 The next day, flip the marshmallows onto a greased cutting board. Cut marshmallows using a knife dipped in hot water to prevent sticking. Or use cookie cutters you have dipped in a little oil. This may be the recipe that finally makes me get up and make marshmallows! Sounds and looks awesome! This looks like awesome hot choc! And I have seen a few other bloggers review Carrie’s book…looks great! Maple marshmallows sound awesome and I don’t even love maple. It is below 0 here this morning and this just sounds fabulous! 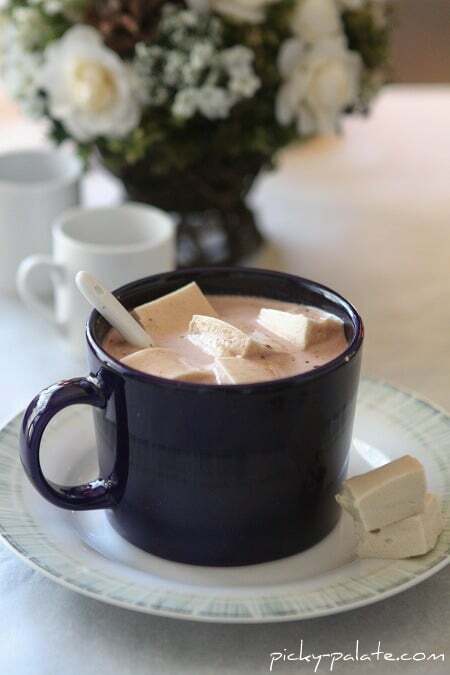 Love the combo of maple syrup marshmallow and hot chocolate. Looks exotic! 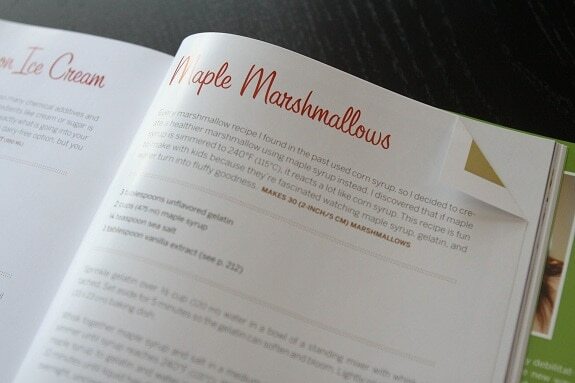 I never thought about making marshmallows at home…..but they are on my list of things to make now! Thanks for sharing the details of the book – sounds great. i have been wanting to make marshmallows for as long as i can remember…these sound amazing! Jenny, such a lovely review of Carries book. That hot cocoa with marshmallows looks great for a day on the slopes, or any time really! Yum! Both of these sound delicious for a chilly day. I love Carrie’s cookbook. So many great recipes. I had the hot chocolate on my list of must tries. Waiting for the next cool front to come our way to make it. Thank you for a beautiful post! I can’t wait to hold your book in my hands soon! Maple marshmallows sounds genious!! =] Yummy! I love homemade marshmallows so much! Can’t wait to try these. I’m so excited about this book too! Waiting on it’s arrival right now!! Yum! Maple marshmellows! How delicious!! I have been eyeing that recipe in Carrie’s beautiful book. Now I will definitely have to try it. That opening photo is beautiful! the marshmallows are making my mouth water. And not because I’m Canadian, just cause they would be unreal in that hot chocolate. Jenny, what a nice review of Carrie’s book and a great choice. Your pics really do it justice! Maple marshmallows, oh my gosh! This sounds so delightful! What a fab recipe! I also checked out Elizabethan desserts…Love it. I am not a big coffee drinker, but I LOVE a big ole cup of hot chocolate on a cold morning (or afternoon) (or evening)! I will definitely be giving this one a try! Yummy! I’ve made homemade marshmallows before, and while they are involved to make, they result is always scrumptious! That book looks great–as does the Hot Chocolate. In other news, I made your chickpea, pepper, and arugula salad today and it was great! I added a little sprinkle of feta which gave it a nice layer of flavor. I will be making this one again! Wow. My heart is aching to make this. You made those marshmallows?? I SO want to make those. Sounds so yummy, especially on this snowy NYC day! I’m not generally a marshmallow fan, but maybe homemade ones would be more tempting. You’ve just kicked my favorite thing–hot cocoa–up a notch! 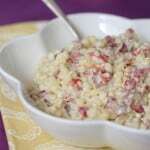 I’ve been perusing your recipes and am a new subscriber. I hope you’ll come visit The Executive Mom and join Burnt Toast Thursday, our simple recipe swap.